Slimy slugs and snails can make a mess of your garden. There are several ways to limit the damage, though. MOST GARDENERS DETEST slugs and snails. It’s hard to like slimy creatures that damage edible plants and prized ornamentals. There’s a reason these mollusks are so destructive. Slugs and snails typically have more than 20,000 teeth. They eat several times their body weight every day and are capable of traveling up to 40 feet in a single night in search of food. They also build up large populations. They have both male and female reproductive organs and are capable of mating with themselves, if necessary. They lay clusters of 30 to 50 eggs at a time. Most slugs lay at least 200 eggs per year. The brown garden snail can lay up to as many as 500 in one season. Studies at the University of Washington found that during May, the typical Western Washington garden contains about 6,000 slugs. It’s nearly impossible to totally eradicate all these troublemakers from your garden, but by using a mix of strategies, you can keep populations low enough to minimize damage. To start, do a computer search, and you’ll find the plants rarely, if ever, bothered by slugs. Some of my favorites include fuchsia, geranium, crocosmia, penstemon, heuchera, salvia and kniphofia (torch lily). There is evidence that planted in substantial numbers, astrantia — an attractive perennial — might even repel slugs and snails. It makes sense to avoid highly susceptible plants, but it isn’t practical to restrict gardening to only resistant plants. We wouldn’t be able to grow lettuce or basil, and ornamental gardens would have to go without perennials such as delphiniums, lilies, dahlias and a slew of others that require protection, especially when they’re young. And even if slugs won’t leave it alone, how could anyone live without an ‘Empress Woo’, the honker of all hostas (eventually growing to 5 feet tall by 6 feet wide), in the garden? Most of us rely on slug bait as a critical tool in the battle to protect vulnerable plants. The iron-phosphate-based slug baits, such as Sluggo, Worry Free and Escargot, are effective, and significantly safer to use around pets and children than the ones that contain metaldehyde, but use them with caution. A recent study found that even the safer slug baits can be harmful to dogs, especially if eaten in high quantities. Follow label directions carefully, and store these products in a secure location, where pets and children can’t reach them. 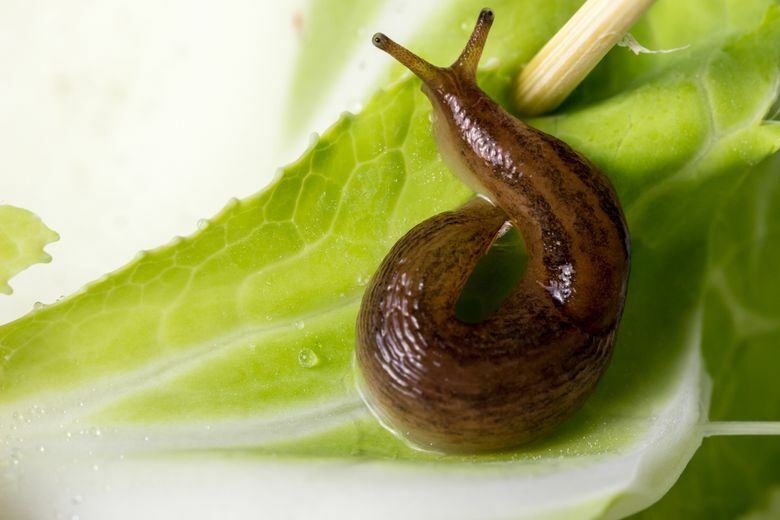 There are plenty of nontoxic strategies that can help keep slug and snail damage to a minimum. A natural solution that is 100 percent effective at repelling slugs and snails is to install a 3-inch-wide barrier of copper foil (available at quality nurseries) on the sides of raised beds and containers. Slugs and snails won’t cross the barrier because the movement of their stomach muscles, combined with the slime, creates an electrical charge on the copper. Remove any slugs that are in the planter box before you attach the barrier, because you certainly don’t want to trap them in. Make a habit of going out at midnight from time to time to collect and drop the slimy interlopers into soapy water. You also can entice slugs for a last drink at Slimy’s Saloon by putting out cottage-cheese containers filled with a half-inch of beer. Snails are not attracted by beer, but slugs don’t know when to say “when,” so they drink too much and do themselves in. Finally, the brown garden snails found in most of our gardens are actually escargot. They were brought to California in the 1800s by a Frenchman who erroneously thought Americans would develop a taste for them. We didn’t, but the snails found our plants quite tasty and have worked their way up West Coast gardens into Canada. Fortunately, there is an effective biological control: Invite French people to move into your neighborhood.